Find wedding singers in New York who will perform at your event for an affordable price. We've listed all types of wedding musicians in New York, who are guaranteed to put on a good show for everyone at your wedding ceremony or reception. A Great Guitar and Cello Duo in New York! Voted as one of the top wedding musicians in New York by brides in 2011's edition of WeddingWire, Penguin Music is a small ensemble that plays for events throughout New York City and parts of New Jersey. 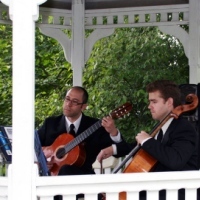 The versatile guitar and cello duo can play such genres as classical, jazz, rock, and pop. Whether you're looking for traditional wedding music or beautiful renditions of your favorite pop or jazz tunes, Penguin Music can cater to your needs. The duo will provide music for the prelude/postlude, processional, meditation, and recessional. The talented New York wedding musicians are also available for cocktail hours and other parties. Call now for your consultation!